Kingdom Hearts II was re-released in Japan on March 29, 2007 as a 2-disc set titled Kingdom Hearts II Final Mix+ (キングダムハーツII FINAL MIX+, Kingudamu Hātsu II FINAL MIX+?). The first disc contains Kingdom Hearts II Final Mix with a new secret movie and additional battles and items. 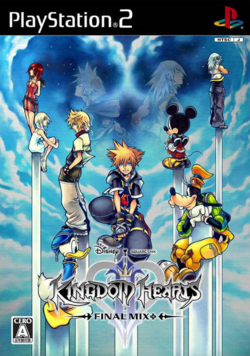 The second disc contains Kingdom Hearts Re:Chain of Memories, a 3D PlayStation 2 remake of Kingdom Hearts: Chain of Memories with extra scenes and voice acting. The battle system maintains the card gameplay, with the addition of Reaction Commands from Kingdom Hearts II. Like the first game's Final Mix, the two games serve as a canonical update to the series. The book Kingdom Hearts -Another Report- was included along with the game for those who reserved a copy. Based on Amazon.com figures, Final Mix+ was the number one PlayStation 2 game in sales during the week of its release in Japan. Nomura cited the presence of Kingdom Hearts Re:Chain of Memories to explain why Kingdom Hearts II Final Mix+ was so popular. Nevertheless, in a Famitsu poll in July 2011, Kingdom Hearts II Final Mix was voted the most popular entry so far. It was released for the first time outside Japan as part of Kingdom Hearts HD 2.5 ReMIX. This page was last edited on 3 October 2017, at 04:53.